We saw this photo on GourmetAttitude.com and thought: We must make this! It’s a beautiful summer salad; and since good cherry tomatoes can be found year-round, it’s also a treat for Valentine’s Day and Mother’s Day. For more food fun, you can serve the salad in individual Martini glasses. 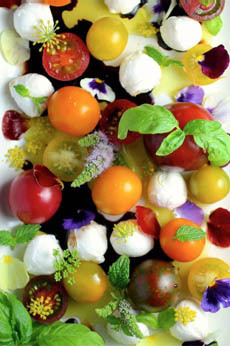 We call this salad “Flower Power.” Photo courtesy GourmetAttitude.com. You can dress the salad in oil and vinegar, allow guests to pour their own from cruets, or drizzle olive oil and vinegar on the plate before adding the salad, and allow guests to “swoosh” the tomatoes in it. 1. TOSS the tomatoes with a small amount of salt. Combine in a mixing bowl with the drained bocconcini and herbs. 2. SERVE on a platter or shallow glass bowl or on individual plates. Formally called Cacio de Roma, cacio is a semi-soft Italian cheese originally made in the countryside outside of Rome from sheep’s milk. Cacio simply means cheese in some dialects (formaggio is the word used universally in Italy). 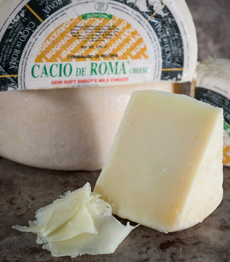 The cheese—not readily found in the U.S.—is made in small rounds called caciotta and aged for about one month. It is a classic sheep’s milk cheese. Like mozzarella, made from the milk of cows or water buffalo, it melts very well for cooking and is enjoyed as a snack, with pasta, pizza and salad. Like most recipes, Caprese salad has evolved. The original name originated on the island of Capri, on the south side of the Gulf of Naples in the Campania region of Italy. The island has been a resort since Roman Times. But Caprese Salad is a more modern invention, dating (by name, anyway) to the early 20th century. The original salad was made with four ingredients: cacio cheese, beefsteak-type tomatoes called cuore di bue (steer’s heart), whole basil leaves and olive oil. Later, possibly after World War II when American tourists ventured to Capri (it was a Jet Set favorite), sliced mozzarella (fior di latte or bufala) replaced cacio and the recipe spread throughout Italy and overseas with the tourists who loved it. In classic style, slices of mozzarella and tomatoes plus the basil leaves were overlapped on a plate, drizzled with olive oil.